Welcome again Free folk of Middle Earth to another edition of the Hobbit Hollow Construction Blog. Glad to have you back as always. The weather is supposed to get better soon so hope remains…..while company is true. This coming week is supposed to bring with it mid to upper 40’s in the temperature department. That would be outstanding. We’re also going into daylight savings time this weekend. So I’m hoping I can get in an hour or so of work every once in a while after work and before dinner. This air sealing stuff is really tedious. 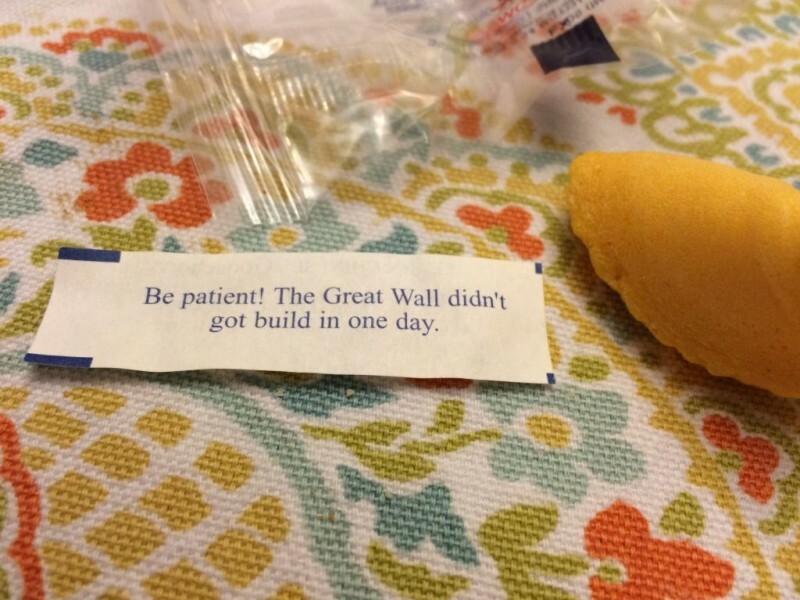 So as you might have imagined judging from the title things didn’t turn out exactly as planned this weekend….and I’m not referring to the fortune cookie. I got a phone call Thursday afternoon from my Mother who recently turned 75. (Congratulations Mom!) The dreaded ceiling water drip reared it’s ugly head in her dining room. This is usually the result of what we call in the Northeast an “ice dam.” To make a long story short she has a small roof over a portion of her dining room that was covered with snow. Naturally I’m thinking get the snow rake out and get the snow off this portion of the roof. Which I did. Funny, there wasn’t an ice dam at this location. 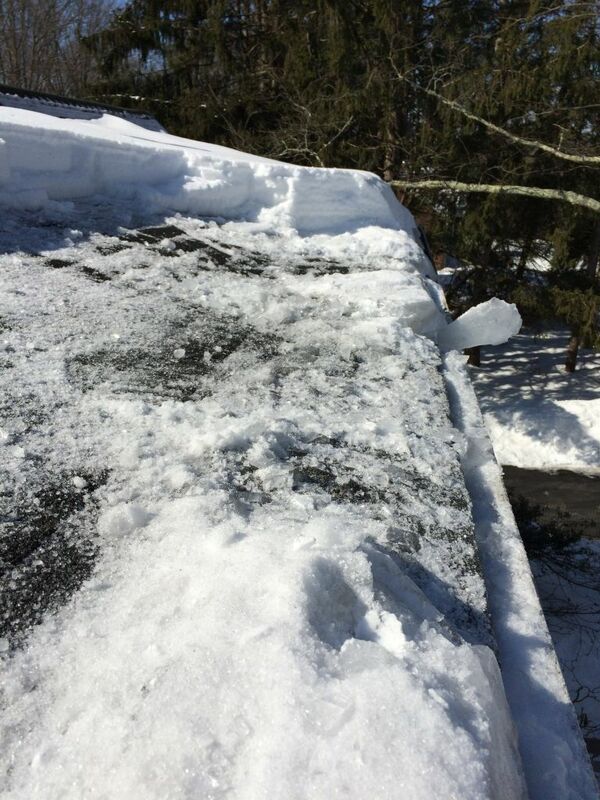 The ice dam is located on an upper portion of the roof that is above the second story. At the time I didn’t think much of it and I told my Mother that if the water starts to leak again give me a call. Saturday morning, you guessed it, I got the call. But the water is coming through the upstairs bathroom ceiling. Now I knew I had a real challenge. I had to break up the ice dam that I noticed up there the other day. What is an ice dam anyway, Jim? Well I’m glad you asked. The simple version. So when you have a foot of snow on your roof and your house isn’t properly insulated, heat escapes melting the snow that’s in direct contact with the roof. Once the snow melts, the water runs down the pitch of your roof towards the edge. Once the water gets beyond the vertical wall plain of the house there is no longer any heat to keep the water in a liquid state and then it refreezes at the bottom of the roof line. This continues to happen over and over again until you get a build up of ice 4 to 5 inches high. Once this occurs the water can’t travel up and over the ice dam and then starts to back up under the roof shingles.It then looks to find a way into the house. This is what happened over at my Mother’s. Check out this picture. Breaking up a ice dam. I don’t know if this is entirely clear but there was about two feet of snow on top of 5 inches of ice. So this is at the second story level so I had to get a ladder and break up this ice with a hammer. I used a snow rake to remove the snow and then started whacking away at the ice. Let me tell you, this was tough work. My arms were dead after I finished up. I mean I was totally exhausted and it’s dangerous work, too! I finally finish up and I’m bathed in sweat. I get back down to the ground and my mother says: “Why is your face all wet?”Really? Is that a trick question? I told her I brought some warm water up there to splash on my face every once in a while. Just cause it feels good. Needless to say we didn’t get up to the house until almost noon and I was a bit beat to boot. Terence’s friend Paul helped and we got back into air sealing the slab. Like I mentioned before it’s tedious work but it really is essential to get this part right in order for the house to perform properly later on. It may not seem necessary but small drafts coming in through the floor could make a difference in your comfort levels and will definitely make a difference in your heating and cooling bills. Another added benefit of air sealing which I’ve never heard mentioned before is insects. Once this slab is completely sealed there is no way for anything to crawl through. Remember this is a slab on ground.The Styrofoam is treated for termites but there still will be no way for them to find a pathway through the slab and into the house. I don’t know how much that appeals to people but I have ants in my house in the spring and they really are a pain in the neck. 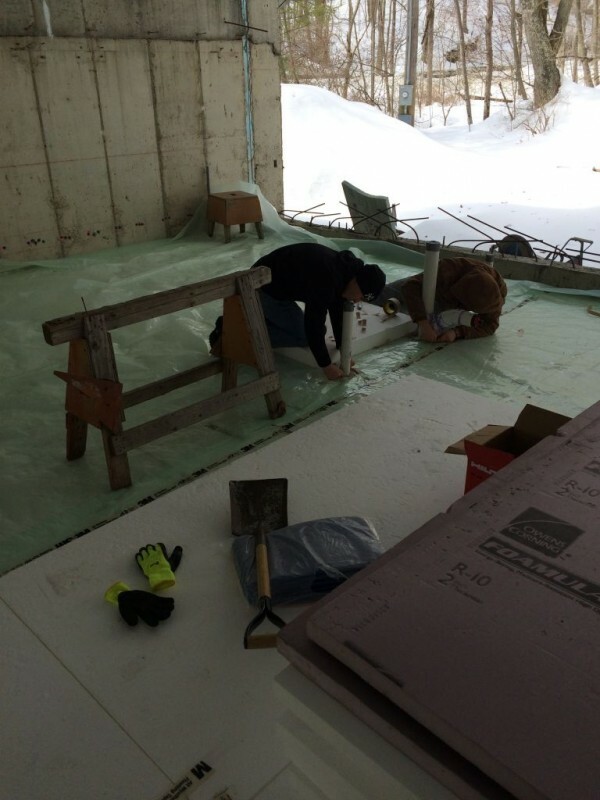 Well, here are Terence and Paul sealing the air barrier. Sealing the air barrier. Terence and Paul. We worked for about two and a half hours or so and then I had enough. Like I said I’m hoping to do a bit after work during the week if the weather’s nice. I also might have to work next weekend putting up a crane on 58th street and Central Park South. So next weekend could potentially be a bust. We shall see. Oh yeah, the fortune cookie. So I said way back in the beginning (The first blog post?) that this project was going to take a while and that we’re going to have to be prepared for the long term. You know, Rome wasn’t built in a day kind of a thing. Either is this Hobbit house. Check out this fortune I got in my Chinese fortune cookie the other night. The Hobbit House won’t got build in one day either. Patience is a virtue, right? Have a great week! PS 1: Georgia is recovering nicely from her wisdom tooth extraction and no longer looks like an overstuffed chipmunk. PS 2: Jude sadly has fallen off the wagon and is now back to mixing his breakfast cereals again. An Unexpected Day in the Rain………..The Cat Did What????? I’ve always understood that Daylight Savings had to do with school, not farming — avoiding having children wait for the bus in the dark. Farms don’t care what clocks say. Actually, it’s a pain because animals get set in their schedules and complain (the donkey is loudest) when you are an hour late for milking/feeding/moving. ps. Passive House books came. I’m reading up. Hey Sally! Thanks for writing. I actually looked up Daylight Savings Time on the internet. Apparently it was set up to save energy during World War I. The whole idea is for people to not turn their lights on for that extra hour at night time. I guess it works. Of course there are advocates who say there is no energy savings. I guess feeding time for the animals wasn’t part of the consideration process. Oh well. Let me know if you have any questions on the book info.